In January, Columbia's Sabin Center for Climate Change Law and the Climate Science Legal Defense Fund launched the Silencing Science Tracker (SST). As its name suggests, the SST records government attempts to prevent or restrict scientific research, education, or discussion since the November 2016 election. Initially, the SST only recorded anti-science behavior within the federal government, of which we have 161 examples. That does not, however, reflect the full extent of the "war on science" as numerous anti-science actions are also being taken by state and local governments. To increase awareness of those actions, we have expanded the SST, adding state and local government attempts to censor, misrepresent, or otherwise stifle science. As of Monday, September 24, the expanded SST lists 257 anti-science actions taken by government actors since the November 2016 election. Of those actions, 63 percent (161) were taken by the federal government, and 37 percent (96) by state and local governments. Unsurprisingly, many of the state and local government actions are concentrated in just a handful of areas, which have a long-history of anti-science behavior. 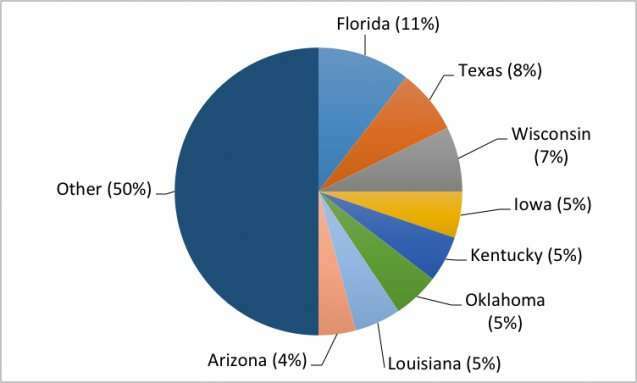 Florida leads the way with 10 entries, followed by Texas and Wisconsin with 7 each, and then Iowa, Kentucky, Louisiana, and Oklahoma with 5 each. It would, however, be a mistake to think that anti-science behavior is limited to a small number of "rogue" states. On the contrary, such behavior has occurred in at least 38 states since November 2016, including many often thought of as leaders on scientific issues, such as California and Vermont. The entries fall into seven broad categories. 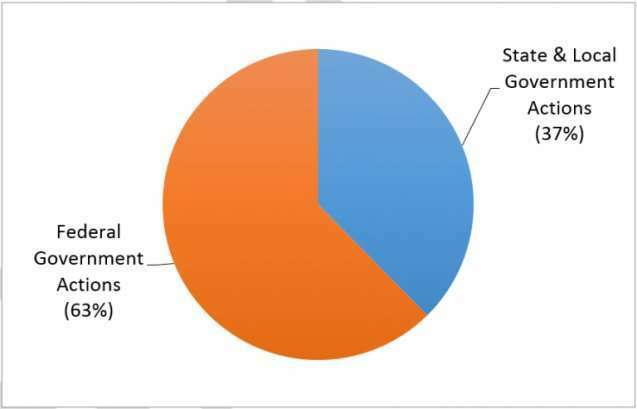 The "government censorship" category currently includes the most entries, accounting for approximately 29 percent of the total. Many of the entries relate to changes to government websites to remove references to "climate change" (see here for an example). Of late, however, this has been far more common within the federal government than at the state level. (We have only identified one example—in Wisconsin—of references to "climate change" being removed from state websites since November 2016.) However, state governments have sought to restrict access to information about climate change in other ways, including through "interference with education," which accounts for over 10 percent of all SST entries. Both state and federal government actors also commonly engage in "bias and misrepresentation," with many suggesting that climate change is a "hoax," and/or questioning its causes and effects. Unfortunately, there is little indication that these attacks on science will subside in the near future. For as long as they occur, we will record them in the SST. This is a good beginning towards exposing the criminal conspiracies and subversive infiltration into government agencies. Of course now we have to listen to the paid deniers squawking about how their fake facts should be allowed to freely subvert Public opinion. Actually, I wouldn't object to an honest debate, But the corrupt will continue their poisonous efforts to silence any criticism of their masters. To prevent those who profit from destroying the Earth's environment, to never be held accountable for their criminal behavior. Among other things, consider the issue of just how much "science" there is out there to be at war with! Look at every marquee for Phys Org, for example, and you'll always find at least one article about facts about some area being "not what was expected" or "different from what was claimed"! Pluto was demoted from a planet because of apparently unreliable material in a book from the beginning of the 19th Century! And no one was told that was the "source" for demoting Pluto! And the fact remains that between 50% and 90% of all examined articles in "peer reviewed" "science" journals provide irreproducible "results"! "Science", it seems can't get anything right! And the only thing "science" devotees come up with is, when results don't pan out, "science" changes its mind. Face it, it can be far more helpful if it produced the right result the first time! gosh jp, considering your intent is to peddle superstitious nonsense to the gullible? You might self-examine your own motives at blindly accepting unverified versions of officially dictated interpretations of mediocre translations of prehistoric ignorance. The greatest difference between theocracy and Science ? Is that scientists at least. make an effort to learn from their mistakes. Persevere through the embarrassment to accomplish progress. Religions are fossils. Coprolite to be exact. They eventually erode away, Too dumb to confront their own errors and accept that they need to change as society evolves.